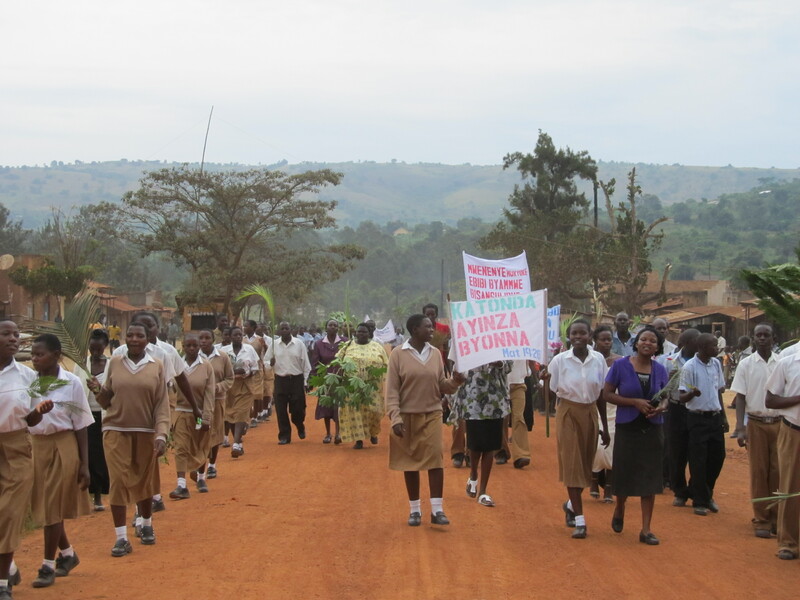 I had been told by many of the clinic staff as well as some of the teachers that I needed to be in Kibaale for Palm Sunday because there was going to be a parade. Now, I have to say that my first thoughts were of the types of parades we watch of TV with all the floats, marching bands and balloons…. but I knew that was not going to be the type of parade that was going to happen in Kibaale….. so I was very curious and I made it a point to be in Kibaale for Palm Sunday….. It was just after 8:30 am on Palm Sunday when I watched a large number of the primary students in their blue uniforms run and dance across the field on their way to their classrooms. It was Sunday morning and not a Monday or Tuesday morning….. then a few minutes later I heard the angelic voices of the primary students singing…. the drums were bounding out the beat and the voices were raised in praise and worship. As I was enjoying the majestic voices……. I heard a second set of sounds but from a sound system….. the volume was loud and the voices sweet…. these sounds were coming from the otherside of the school grounds from the secondary classrooms….. I had gotten up early and was dressed in my Sunday best in anticipation of this exciting event….. the parade. So, I wondered down towards the secondary classes to find the school truck filled with a loud speaker system and a few students…. behind the truck were two lines of students dressed in their brown and white school uniform with some of the students carrying banners…… in English and in Lugandan…. says like Jesus lives… Life is meaningless without Jesus…… Jesus reigns. The parade or the procession was lead by the primary students followed by the school truck playing the praise and worship music……… the secondary student followed behind the truck…… It was a festive and celebratory parade…. with each student waving a small palm branch…. the procession walked slowly down the hill into Kibaale centre and down the main street. I could not help but think that we as the students and staff of Kibaale Community Centre were re-inacting the famous procession on Jesus riding on the donkey entering into Jeruselem over 2,000 years ago. This was not any parade but a celebration of the life of Jesus Christ…. it was a parade which had the locals stop whatever they were doing to listen to the praise and worship music as well as verses read from the Bible….. some of the locals joined the slow procession….. a few took pictures….. It was an amazing event. I have never been part of a praise and worship parade before…. the students and staff were not only singing along with the music but dancing in celebration. It has been a long time since I had so much fun……. Our slow procession down the hill and back up the hill into the Kibaale Community Centre took just over one hour…… the procession walked worshipful straight into the community centre building where Pastor Eric, the chaplain had all the staff and students wave their palm branches as he told the Easter story. There are no words to describe the exciting, majesty and amazing atmosphere that was created by this parade… this was far better than any parade I have ever seen or experienced. Hey Margo is Kaylee from the Pacific Academy Team that came over spring break! i totally miss Kibaale soooooo much! The Kids look great with their signs! Easter must have been a great event there.